I’m setting up OptimizeMember to run 2 different levels of membership. I’m also using BuddyPress. Here’s the issue – I’ve created custom pages to go to unique sections of the website. Level 0 (free), Level 1 (pro), Level 2 (master). Each level has duplicate pages but each one allows more content and access. I’ve also created custom menus for each membership. However, BuddyPress uses the blog pages not custom pages. Since I can’t seem to find a way to a CSS Code or redirect code from the Blog Menu that will direct Member Level back to their current level. How do I customize the Blog Menu (both paid membership levels have access to BuddyPress) so members can go back to their current state of membership? I’m afraid I can’t help you on this because I don’t use OM and BuddyPress. Thanks for sharing with us your knowledge. I’ve a question – I used OP 2.0 for all my pages. I upload a Row Background Image (using LiveEditor), you can see here. The problem is that all this images are not responsive. If you see my website with smartphones or tablets you can realize that the images are cut. That is strange because OP 2.0 is responsive, in fact, the other part of my site is responsive. Can you help me. Is there a CSS code to fix this issue? Thanks man for all your support. There’s no ‘standard’ CSS to do this. You’ll need to write some CSS manually to scale your background image on different screen sizes. Maybe you can refer here. They are not really responsive but it was a good solution. Thanks KM! Thank you so much for all of these great CSS tips. Question: Is it possible (If so, how?) to have top navigation right justified and bottom navigation (below header) center) Seems I can only make them both the same justification. I am using a banner image not a logo. Quick question… I can’t find any information on how to make the Stripe form look more attractive and function more intuitively with optimize press / optimize member. Do you have any CSS tips for Stripe? Hi, it would be really useful if we could copy and paste code from this page ? I’ve shared all the CSS code (in PDF format) at the end of the post. Ok, I’ve got this useful document and tried the code you suggest to change my copyright message but it remains the same? Not really get what you mean. You can change the copyright text directly from the settings in OptimizePress without code. Thank you. Is there some CSS that I can add to the Login Page to change the size and wording of the Log Me In button for the membership login element? hey, thanks for all this! Any chance you can help get my nav and site full width? I realized it’s “easy” to do in all the settings, but for some reason it just isn’t working despite doing everything correctly. even got a web design friend on it and he couldn’t figure it out! I’d really appreciate a fix. Thank you! It’s definitely “not easy” to do because you’ll need to modify the column width via custom code. You also need to make sure your site looks good in all devices. You have custom CSS code with your copy disabled on your blog? How can I add Images on the sidebar of a blog and posts on OptimizePress? 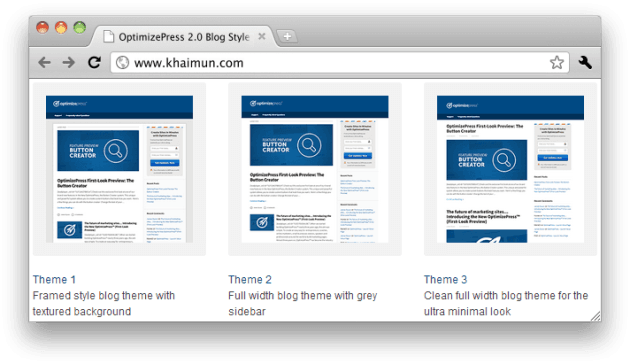 Did you know how to adjust the width of blog post when we choose page template with only one column when edit the OptimizePress settings in create new Post? Great post, I’ve been struggling to get the blog text to shift to uppercase. I’ve been able to do it for all the live editor pages but not the blog. I also tried pasting the same code into the other scripts in the blog settings but no luck. Got it, just needed to change the page names to uppercase in this example. How would you change the background color of the blog navigation drop down menu? In your WP Dashboard, go to OptimizePress → Blog Settings → Layout Structure → Header & Navigation Preferences → Blog Primary/Top Navigation → Dropdown Background/Dropdown Background Hover. GREAT HELP! But can’t find the one thing I need. I need to change the padding around the ‘page/category’ you are presently on the ‘where you are’ heading which sits below the navigation. It’s about twice the height of my banner or navigation. It would be nice if we could select and copy these codes. Thank you!